On Monday, Trump hosted a 2020 strategy meeting with some of his advisors. 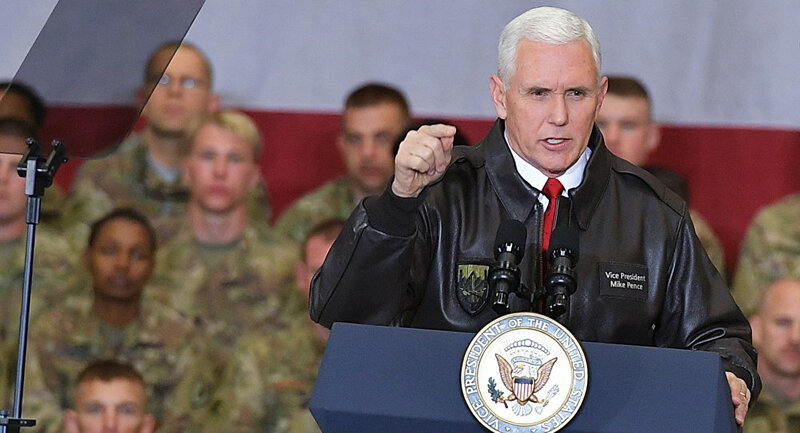 According to Gabriel Sherman in Vanity Fair, one of the topics discussed at the meeting was Pence's viability in a 2020 race that is expected to draw candidates fiercely opposed to the current administration and whether Pence will add anything of real value to Trump's ticket in that context. "They're beginning to think about whether Mike Pence should be running again," a source told the publication, adding that new polling has proven that Pence does not widen the coalition of supporters of the president. In other words, Pence, who is known for his Christian religiosity, may be nothing more than a hanger-on to Trump, who already has a firm grasp on the Evangelical vote. When it comes to building up Trump's base, Pence "doesn't detract from it, but he doesn't add anything either," the source told Vanity Fair. "Trump has been very clear that he does not plan to replace Mike Pence and although you can't always take the presidents word, I think he's telling the truth this time," award-winning editorial cartoonist Ted Rall told Sputnik News. "Pence has been extremely loyal and knows were all the bodies are buried. I'm sure he'll be around for a second term." This is just the latest news indicating that Pence is standing on thin ice in the run-up to the 2020 race. The New York Times reported in November that Trump has asked his advisers whether Pence is trustworthy and that advisors outside of the administration are pushing for outgoing US Ambassador to the UN Nikki Haley to take Pence's slot. While rumors about Pence's departure are emerging now, they follow a long string of reports about the impending departures of a number of officials. The Beltway press spent months speculating that Trump would fire Attorney General Jeff Sessions, which he eventually did. White House Chief of Staff John Kelly has also been rumored to have one foot out the door. According to Vanity Fair, the debate over Pence's political value to the administration has been fueled by Trump's "stalled search for a chief of staff to replace John Kelly." Kelly has yet to announce his resignation, however. One of the paper's sources says that Kelly has been telling Trump that Pence provides him no political value. "The theory," according to Vanity Fair, is that Kelly is frustrated with Pence's young chief of staff Nick Ayers, who appears to be gunning for Kelly's position. "Kelly has started to get more political, and he's whispering to Trump that Trump needs a running mate who can help him more politically," the outlet's source said.